Well, that was the traditional afternoon tea, and still is for those who love the nostalgia of long ago. And that's fine. But if you're a modern girl or guy, you will probably want to experiment with new recipes and ideas for tea parties. If you plan a traditional party, then choose cucumber, watercress, or a spread like pimento cheese for your sandwiches. Hummus is another spread possibility, one that has become more popular these days. The idea is to serve dainty, finger sandwiches. They are not meant to be filling and you shouldn't have to work at them. A few tiny bites and you're done and ready for dessert – a few shortbread cookies or pecan sandies, maybe. A sip of tea and don't forget the pinkie pose! Loaf sandwiches are another sandwich that's perfect for an afternoon tea. This is a sandwich made in the shape of a loaf, then sliced to serve. Breads usually have the crusts cut off, remember we don't want to work at eating these little sandwiches. Choose country white, whole wheat, rye, pumpernickel or raisin bread. A modern version of the tea sandwich would be those mini pocket pitas or mini croissants filled with your favorite hummus or salad sandwich recipe. Served with cucumber chips, raspberry herbal iced tea, and brownie bites and you have the perfect modern tea party. Here are is a list of some traditional and non-traditional recipes for your afternoon tea. I'm sure you can come up with several more sandwiches to add to this short list. And we'll have more to add soon. If you have any suggestions, contact us here so we can add it to the list. Want to see a video for a making cucumber sandwiches? Click here. You'll find it in two parts. Perfect for your next tea party! Here's a video for Curried Chicken Tea Sandwiches - looks good. What do you think? Here's a California Tea Sandwich video complete with avocados and sprouts. And here's one for Waldorf Chicken Salad Sandwiches. This one looks delicious! What's Your Best Tea Sandwich Recipe? 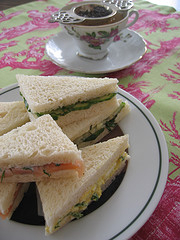 Do you have a favorite Tea Sandwich Recipe? Is it your Best? Are your friends always asking for the recipe? Why not share it? Our visitors will try it. We'll all rate it to see who's recipe is best! Go ahead and share it with us. 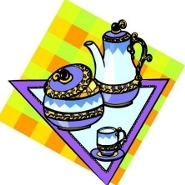 You can also tell us about your tea party if you like. Be as descriptive as you can. Your idea may be the one someone is looking for. The best recipes and suggestions will rise to the top! Your recipe will appear on a Web page exactly the way you enter it here. You can wrap a word in square brackets to make it appear bold. For example [my story] would show as my story on the Web page containing your recipe. TIP: Since most people scan Web pages, include your best description of the recipe in your first paragraph. Do you have a picture of your Tea Sandwich or Party to add? Great! It will make your recipe stand out even more. Click the button. Find it on your computer. Then select it. Important Note: The maximum image size accepted is 800x600. You may want to resize any photo larger than 800x600 pixels using your graphics software or a Web-based resizer, such as Picnik.